Dr. Linder's patented AC and DC generators exploited alpha (proton) and beta (electron) particle emissions from radioisotopes contained within. The device is basically a metallic sphere concentric to an enclosed mounting platform for polonium (α particle emitter), phosphorous (β particle emitter), or similar elements. 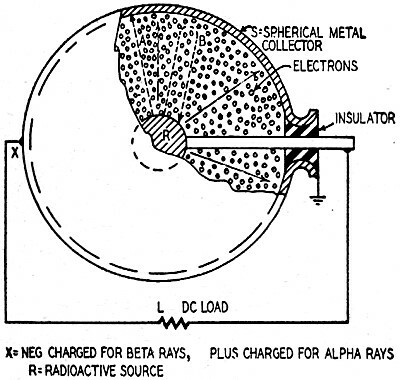 With just a gram of radioactive material, the charge which accumulates on the outer sphere generates a very high voltage (~1 MV) driving a low current (~1 mA). Georg Ohm's work tells us that is equivalent to 1 kW of power - quite a lot for a fairly compact device. Dr. Linder envisioned multiple atomic generators combined in series and/or parallel to obtain the required power. 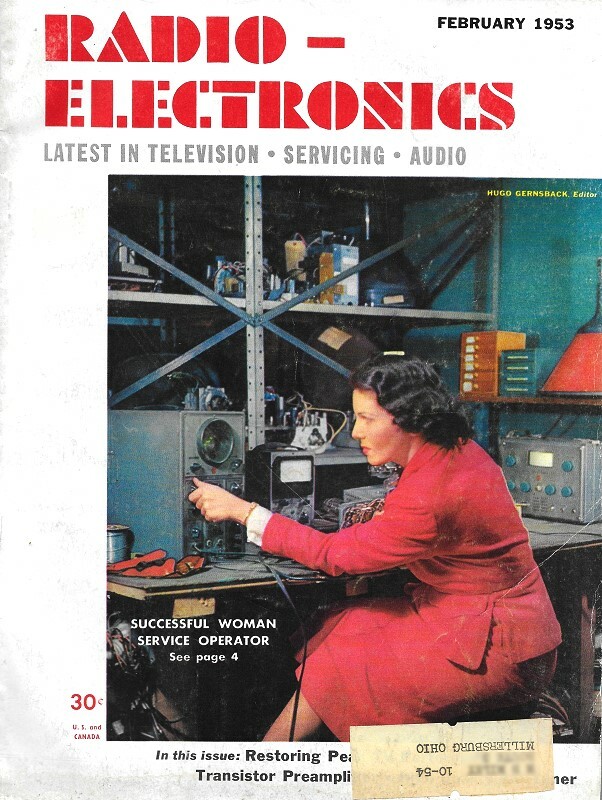 No mention was made of the effective internal resistance, which would ultimately determine the terminal voltage when connected to a load. After all, a 1 megavolt battery would not be of much use in a smartphone (to be invented half a century later) or flashlight. An article appeared in the February 5, 1954, edition of The National Jewish Post that mentions a man named Paul Rapport who worked with Dr. Linder on this device. 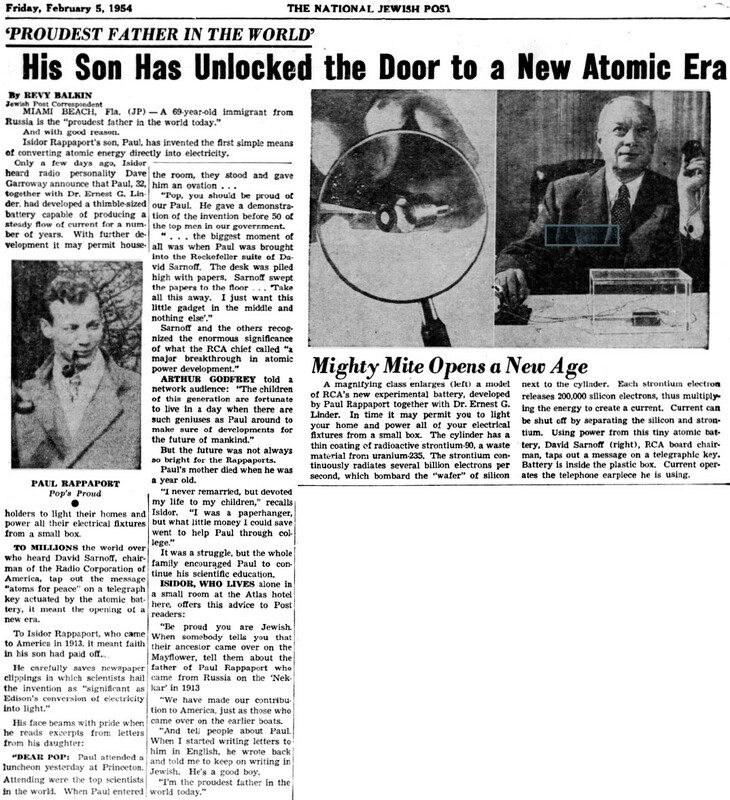 Included is a photo of RCA chairman David Sarnoff along with a small "atomic battery" that exploited the principle. As far as I can determine, these devices never found their way into production, most likely due to the requirement for radioactive material. It is possible to legally purchase small quantities of radioisotopes (see United Nuclear Scientific Equipment & Supplies), although maybe not concentrated enough to power a useful atomic battery. Rumor has it that a suitable quantity of polonium−210 might be available in some UK cafeterias where expatriate KGB agents eat lunch. 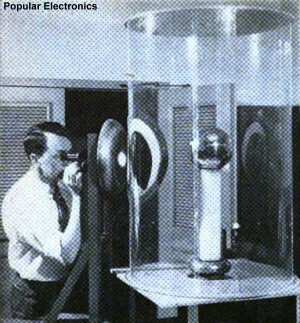 Dr. Ernest G. Linder with atomic generator. Fig. 1 - Linder atomic d.c. generator. Fig. 2 - Generator for high frequencies. Dr. Ernest G. Linder, research physicist with the Radio Corporation of America, has taken out a patent (No. 2,598,925) for the direct production of electric current from atomic sources. In its simplest form, the Linder atomic generator consists of an evacuated metal chamber, in Fig. 1, in which is mounted a radioactive substance R, such as polonium. Electrons from the radioactive substance strike the metal shell S and build up an electric charge on it. If a load L is connected between the radioactive cathode and the metallic shell anode, current will pass through it and do useful work. The emitter, or cathode, of this generator may be either positive or negative, depending on the radioactive element. If it is polonium, it will radiate alpha particles, and the collecting shell will be charged positively. If radioactive phosphorus is used, beta particles (electrons) are radiated, and the charge on the metal shell is negative. As much as two kilowatts of energy may be produced by such an atomic-electric generator. This value is based on the assumption that 1 gram of radioactive phosphorus, occupying but 1/2 cubic centimeter, will emit about two milliamperes of electric current. If the average energy of emission is 1,000,000 volts, the electric energy amounts to 0.002 amp x 1 megavolt, or 2,000 watts (2 kw). Radioactive phosphorus has a half-life period of about 14 days, so the current and power would decrease exponentially to one-half their initial values in that time. Possibly in the near future some simple means will be devised for replenishing the radioactive material in the electric generators periodically. Radioactive phosphorus is a pure beta-ray emitter, which becomes stable after emission. This material is suitable for use as electronic power sources, since it emits no gaseous reaction products and therefore is quite suitable for vacuum applications, Dr. Linder states. In practice it will be possible to modify the atomic-electric generator units or connect them in series or parallel (or series-parallel) groups so that the desired voltage and current values can be obtained. With the a.c. generator the voltage can easily be reduced by a transformer. The impedance of the atomic electric generator is determined by the characteristics of the charged particle emitting substance. A d.c. generator of the type described is suitable for systems requiring high voltage and low power capacity. If large-power generators are to be built, the charged particle element may be cooled by circulating water or a forced air draft. After the electrode S attains the maximum potential of the beta particles, additional particles are reflected back toward the source R, as arrow B indicates. As the collector electrode is resonated at the desired radio frequency, the reflected electrons oscillate back and forth between the source R and the electrode S, setting up an oscillating electric field within the resonant collector. To abstract r.f. energy from this oscillating field, a pickup loop may be used as shown in Fig. 2. 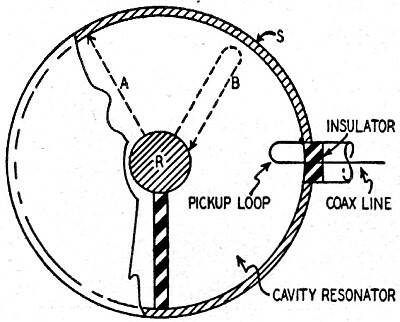 A coaxial cable C may conduct the r.f. current to the load. The operation is similar to that of the reflex velocity-modulated oscillator, or to the older Barkhausen-Kurz oscillator. In a recent interview Dr. Linder stated that he could not discuss his atomic-electric generators in detail, nor disclose for what purpose they are to be used, as this matter is bound up in military security. This general outline is presented here, however, because of the unique operating principles of these newest types of electric generators.